With a market proven design and the most advanced microprocessor control available on benchtop unity, the BENCHTOP Series benchtop lyophilizer exceeds customer demand. This freeze dryer is cost effective and consistently named a high performance bench-top manifold freeze dryer. The BENCHTOP Series has a 2L per 24 hour condensing rate. Two models are available: the BT48 and BT 85. The BT48 is the ideal match for water based samples with a -48C condenser. Conversely, for samples containing solvents or with low eutectic points, The BT85 is the perfect match with -85 C condenser which will provide maximum performance. Overall, this benchtop manifold freeze dryer is the ideal fit for labs that need quick turn-around, hot gas defrost supplies fast/automatic defrosting. Depending on your needs, select either our 6 or 12 port manifold. 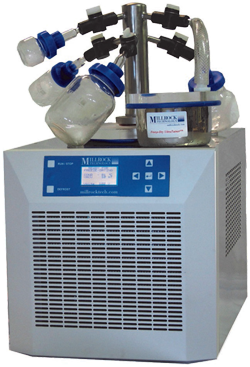 Both options provide ample space for small and large samples to be dried simultaneously.